You would not think that it’s been pouring rain outside. All night and day. Unceasingly. All weekend actually. So I bought bunches of colorful Ranunculus flowers, to cheer up the house and make it sunny. And we took long breakfasts and played games with Lulu, teaching her new hand tricks and how to toss a ball–Oh the joy to see her so proud that she can do it. And when the games were over and she was back to take a nap, I baked muffins and made a pot of red lentil soup for lunch. So after all, it’s been a lovely weekend. Despite the fact that we didn’t go out. Except for P. heading out to buy milk. I also felt a sudden urge to bake a loaf of Irish soda bread. A large round loaf with a golden crust that made me want to bite in it the way I would in a baguette—le croûton (the end of the baguette), you know, is the best part. Patricia, my mother-in-law, would have been proud of that loaf of Irish soda bread, I think. She is the one who introduced me to it during my first visit. Already thirteen or fourteen years ago. And it’s also at her place that, last weekend in Chicago, I found the inspiration to bake. I spotted an Irish cookbook with gluten free recipes, and scribbled down the recipe quickly, right as we were about to leave for the airport. “You should bake a loaf for Saint Patrick’s day,” she said while she noticed that I was busy taking notes. “I might, ” I said. And I did. On Saturday morning. Adding my own touches and edits–such as, for example, not using tapioca flour since I don’t care for the taste of that particular flour in any baked goods, or adding quinoa flakes and using quinoa, millet and sweet rice flours. “What are you making?” P. asked when he walked into the kitchen filled with the aromas of something obviously baking in the oven. Before I had time to respond, he went on: “Oh yum!” after he caught sight of the bread in the oven. It was the first slice of Irish soda bread that Lulu ate–since after all, she is 50% Irish too. It was also the first slice that we ate since quite a long time. Too long, both P. and I agreed. And by the way, I sent my manuscript to my editor on Friday! So happy! Looking forward to her revisions and me having a break to rest and have more time to play outside, find new inspirations and come back to chat more often in this space. There’s already another loaf of Irish soda bread baking in the oven as we quickly finished the first one. Preheat the oven to 450 F and prepare a baking sheet with a piece of parchment paper on top; set aside. In a bowl, sift all the dry ingredients and make a hole in the middle. 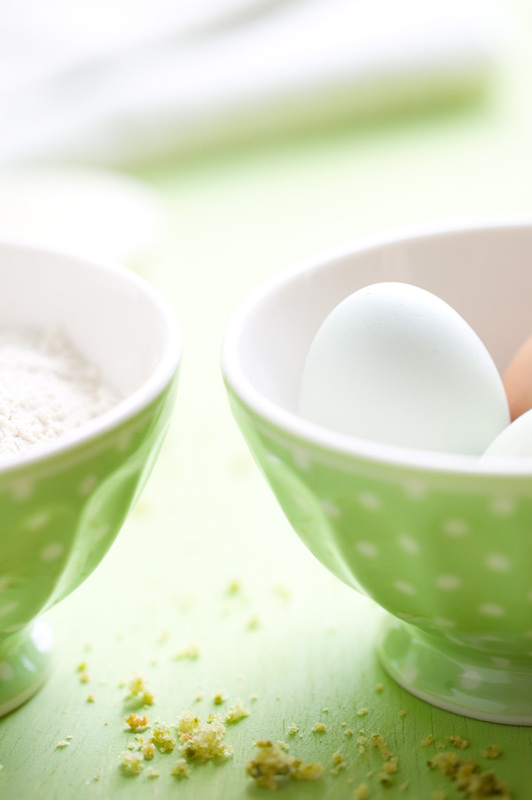 In a separate bowl, whisk the egg and buttermilk. Pour in the hole and using a wooden spoon, stir and mix gently until the ingredients come together and form a ball (sticky but not too wet). Work quickly and do not overwork the dough as this is what might make the bread too dense. 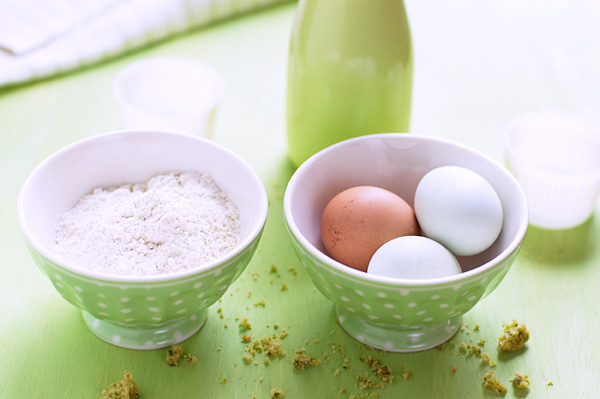 Flour your hands and work the dough gently to shape it into a round. Using a sharp knife or a pair of scissors, make a cross on top of the bread. Transfer to the baking sheet and bake for 5 minutes. Reduce the heat to 350 F and bake for 25 minutes, or until the top of the bread is golden in color. Let cool on a rack. This bread is dense, so I find it best toasted and buttered. Préchauffez le four à 230 C et couvrez une plaque de cuisson de papier sulfurisé; mettez de côté. Dans une jatte, tamisez tous les ingrédients secs et faites un puits au milieu. Dans un bol, battez le lait ribot et l’oeuf à la fourchette. Versez dans les ingrédients secs et mélangez avec une cuiller en bois jusqu’à ce que la pâte forme une boule (elle est collante mais pas trop mouillée). Travailez rapidement et ne mélangez pas de trop car c’est ce qui rend le pain trop dense. Farinez-vous les mains et travaillez la pâte pour la façonner en boule. Utilisez une paire de ciseaux pour faire des entailles dans le pain en forme de croix. Placez la pâte sur la plaque de cuisson et enfournez pour 5 minutes. Baissez la température à 180 C et poursuivez la cuisson pendant 25 minutes, ou jusqu’à ce que la croûte soit bien dorée. Laissez refroidir sur grille. Ce pain se déguste de préférence grillé et beurré, en tout cas, c’est comme cela que je le préfère. My best friend is Irish and a few weeks ago I was treated to this delicious bread (care of her dad)…its delightful with a slathering of butter and jam! First of all, congratulations on sending your manuscript, it’s a huge milestone! This post left me with a wonderful spring feeling. It’s hard to believe it was raining heavily outside! 🙂 I love Lulu’s dress. So cute. those flowers are gorgeous. absolutely gorgeous. ranunculus are so lovely. the bread, as usual, looks great, too! The flowers are wonderful, much needed on this dreary Monday. 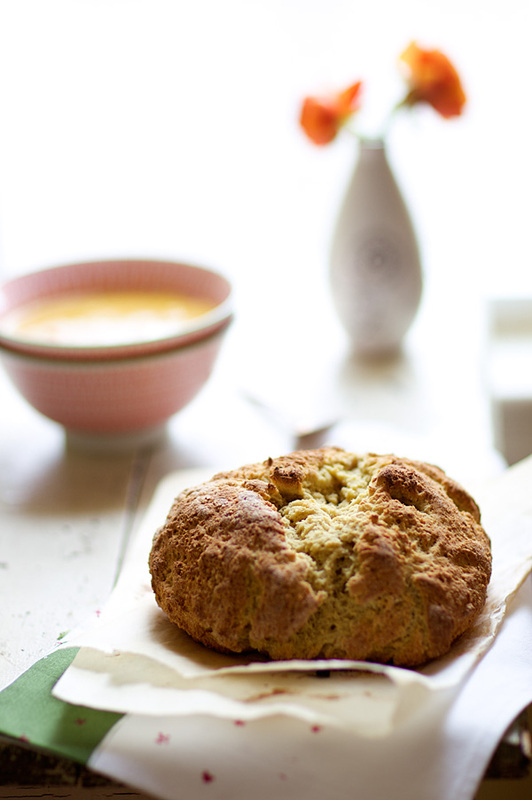 I’ve never eaten Irish Soda bread, but have seen many recipes for it over the course of the last week. Your looks crunchy and lovely. Congratulations on sending your manuscript! Toujours beaucoup de poésie et de douceur. Et ce pain qu’on voudrait toucher! Sometimes the best times are had when it’s wet wet and very wet outside.. :)) Love the flowers.. so bright and cheerful!! Superbes tes renoncules, c’est vrai que ça met de la couleur dans la maison quand il fait tout pourri dehors ! Ton pain m’inspire beaucoup, j’aime tout ce qui est irlandais !! Looks good! I plan on making a loaf on Wednesday for St. Patrick’s Day! I’ll just use regular flour and possibly mix in some whole wheat though. What to put on it though….! beautiful post! can’t wait to whip up a batch of that fabulous bread! That bread looks gorgeous! An interesting recipe. Your pictures are so pretty and spring-like. Lovely! The bread looks really delicious. Thank you so much for the gluten free Irish soda bread recipe! I adore Irish soda bread but have been trying to avoid wheat. I’m so excited to try this. And your pictures make me want to run out and buy some very springy flowers! Soda bread can be SO addictive, especially when just warm from the oven and smothered in butter. Lulu is precious … and so is the post! Beautiful! Beautiful post! 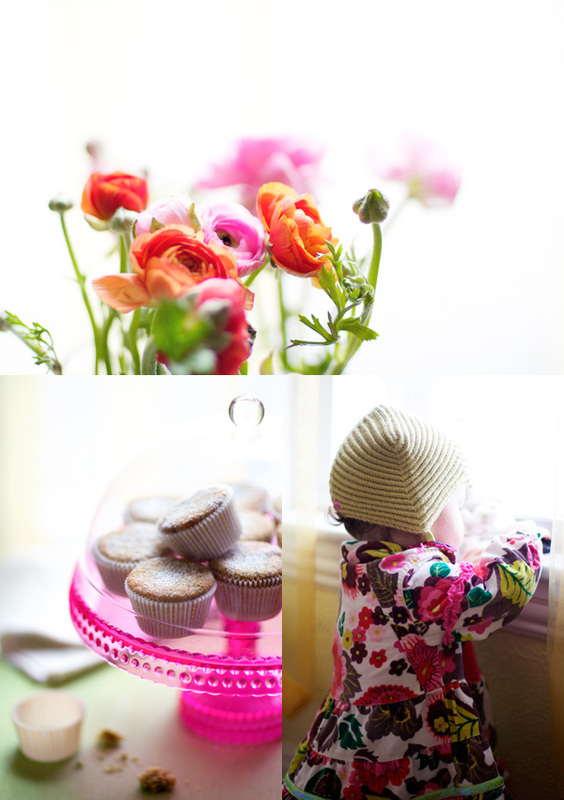 Your little Lulu reminds me of my daughter at that age… lovely child and lovely images! Her dress looks like those I made for my little girl – vintage fabrics that everyone loved so much. I was always asked where I purchased her clothes. It was such fun to find the fabrics and design her clothes — they were just as individual as she is. I’ll try to make the bread as that same little girl is now 19 and cannot eat gluten. Happy St. Patrick’s Day and congratulations on your submission. That’s quite an accomplishment! 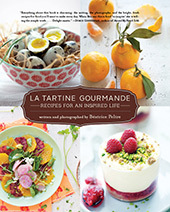 Beautiful pictures and recipes! I just discovered this website (a friend told me about it)! I’m sure I’ll come back for inspiration and the beauty of it. I tried the mushroom risotto recipe and it was delicious! I just had Irish bread two days ago at a Saint Paddy’s party. I love it. Thanks for the recipe. Je suis venue sur ce blog pour la premiere fois aujourd’hui, et je l’ai trouve tellement beau que je l’ai ajoute immediatement a mon Google Reader compte! Bravoooo!! Voilà un pain sans gluten qui devrait faire notre bonheur! Gorgeous pictures! Love the colors on the flowers and Lulus dress! wow…I bet these won’t last in anyone’s presence for very long! Look delish! lovely pictures! Great recipies! Good luck with your book! Ces photos sont vraiment magnifiques, pleines de douceur et de poésie ! i am so trying this bea. i made some gf crusty bread last weekend but it was terrible. must improve on that one. this looks crusty and tender. 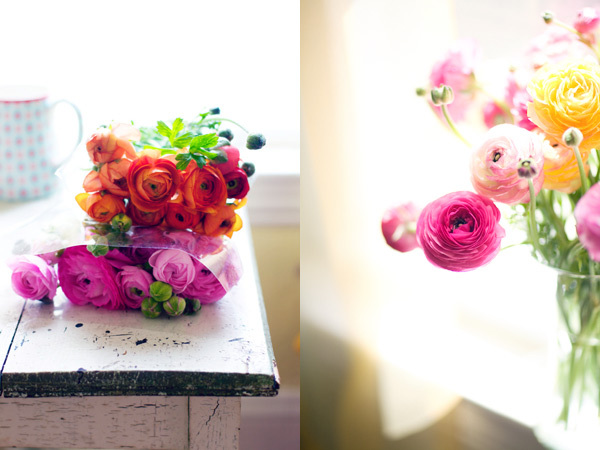 and those ranunculus… my favorite! Sounds so delicious! I love the smell of fresh bread. Not to mention the first bites into it while it’s still warm. Just butter end bread. Heaven! But as with so many other things you just do it too seldom! And when you after that long time bake it again you have this bread-making-period for at least one week! I was just wondering: do you make Lulu’s clothes? They are so lovely and colourful. Thank you everyone! As usual. As much as I’d like to say I have sowing talent, I don’t–although I am dying to learn. So no, I am not making Lulu’s clothes 😉 But have a lot of fun choosing them for her…as long as this can last, I better enjoy! One day, she might want something completely different! I love Irish Soda bread! I can never seem to make it as good as my mother did though. She must have had some secret ingredient I dont know about. Quelle jolie facon de feter la St Patrick, ce vert si doux, ce beau pain craquant, et cette lumiere magnifique – vraiment, il pleuvait dehors? I’ve been in Irealnd for 4 years and love that type of bread – a bit salty but really healty and teasty. Also very nice pictures – do you use a canon or nikon equipment? Nous nous sommes rencontrées au “playground” vendredi. Merci de m’avoir donné le nom de votre blog! J’adore ce que vous faites! Bravo aussi pour votre livre! Mille excuses, le lien de mon blog n’était pas bon…. Your website is so beautiful. I love the way you talk about life, and the ways of enjoying the most of it! I am sending you a big hug from the other side of the world: Rio de Janeiro – BRAZIL! The soda bread looks so delicious and those fresias are so incredibly beautiful, especially the way the light is hitting them! Hi! 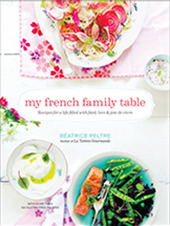 I borrowed one of your amazing images when i listed you as the best in my blog post about the top 5 food blogs. I hope that is okay, just tell me otherwise! My heart jumped when I saw the ranunculus bunches perched on top of your beautiful table top. They are sheer beauty, aren’t they. And now, Lulu’s hat, I adore it. Can you buy an adult size? I’m thinking of making one. Thank you for sharing! come può una mamma così tenera con la sua bambina, cuocere una aragosta viva in acqua bollente? Hello ! je viens de faire votre connaissance sur Envoyé spécial du début d’après-midi.J’aime beaucoup votre univers.Je suis contente de découvrir votre site.Vous faites de jolies choses et vous inspirez une belle sérénité. Vous êtes rayonnante et ne donnez pas seulement envie de cuisiner mais de découvrir et de partager ! Bravo et longue route à vous ! Your blog is so fun to look at! Hello, I´m from Mexico, I have love all the recipes you have done, I have tried some of them, but I wasn´t abble to make this one and I have tried to make this one like 6 times and it doesn´t cook well, any sugestions? Not sure. Sorry it happened. Perhaps the oven temperature? Did you try leaving the bread for a longer period of time too? Quite an inspiration. Picture is worth a thousand words! Soda bread is fantastic – especially if it’s part of an Ulster fry ! I just wanted to say this is an absolutely fabulous recipe! I went by weight, and switched some of the flours (didn’t have the exact same ones) but kept the same flour/starch ratio. It was extremely simple to make and honestly the best bread I’ve made in the 5 1/2 years of being gluten free, and I get compliments on my bread regularly already. Thank you so much for sharing, and now I have a great go to recipe when I need something in a very short amount of time. Jude, you can make your own buttermilk. There are many online recipes, although I have not tried any yet. But know of people who have successfully. I followed the directions to a T, but for some reason the dough was really wet. I had to add about 3/4c more flour [a mix of all three]. It baked about 10min longer but came out perfectly!!! Not sure what the issue was with being so wet, but that doesn’t matter now. I just ate 1/4 of the loaf by myself. 🙂 Thank you! Absolument délicieux ! N’ayant pas de farines de quinoa ni de millet, je les ai remplacées par des farines d’avoine et de riz complet. En tout cas, mon petit garçon de 20 mois a adoré ! Bravo et merci pour votre blog (et votre livre !) plein de couleurs et de belles énergies qui me donne envie de cuisiner à chaque fois que je le regarde ! Oh I have made other Irish soda bread recipes and the bread has been quite heavy, but this bread was light as a feather in comparison. I will totally be sticking to your recipe. Was the recipe supposed to contain quinoa flakes as well? My dough was also extremely wet, more like pancake batter, and I had to add a bunch more flour. Then in reading the recipe header I noticed that it mentioned quinoa flakes and thought maybe they were omitted from the recipe by mistake. Hi Bea, did you by any chance forget to put the quinoa flakes on the recipe? Thanks!